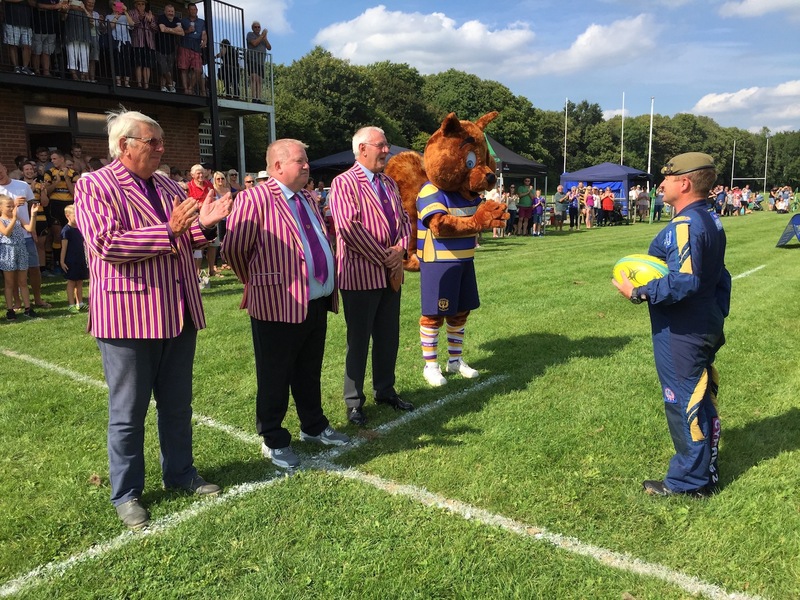 A team of parachutists made a spectacular entry at Uckfield Rugby Club yesterday to deliver a match ball. 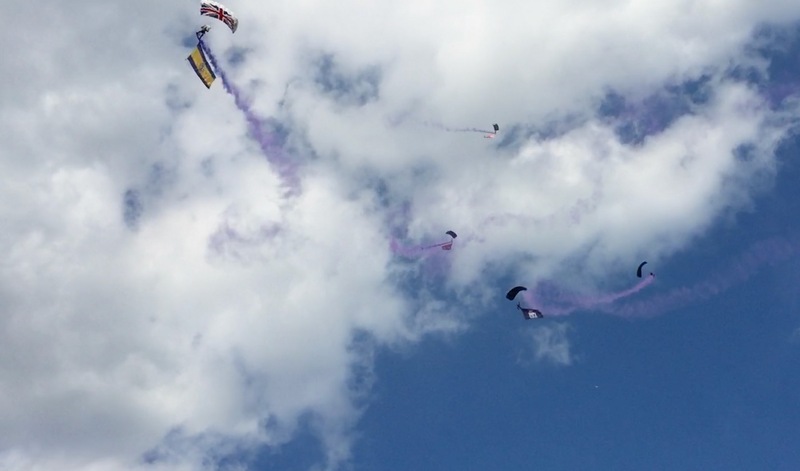 Five members of The Tigers Parachute Display Team, from The Princess of Wales’s Royal Regiment, leapt from a plane after circling several times. The landing site was marked by a coloured flare. At first they were dots in the sky but then they trailed smoke and flags before swooping in. First sight of the parachutists bringing a match ball to Uckfield Rugby Club yesterday. Club officials, director Colin Bowes Crick, chairman Gordon Buckland, and president Pete Reeves, lined up to greet them and Mr Reeves accepted and thanked them for the ball. 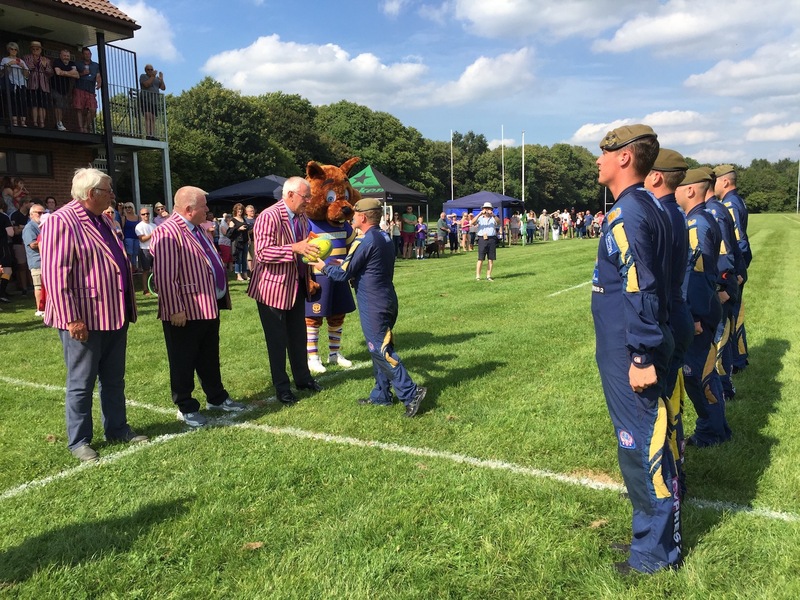 Uckfield Rugby Club officials ready to accept a match ball from members of The Tigers Parachute Display Team. From the left are director Colin Bowes Crick, chairman Gordon Buckland, and chairman Pete Reeves. With them is the new club mascot Scrummy the squirrel. 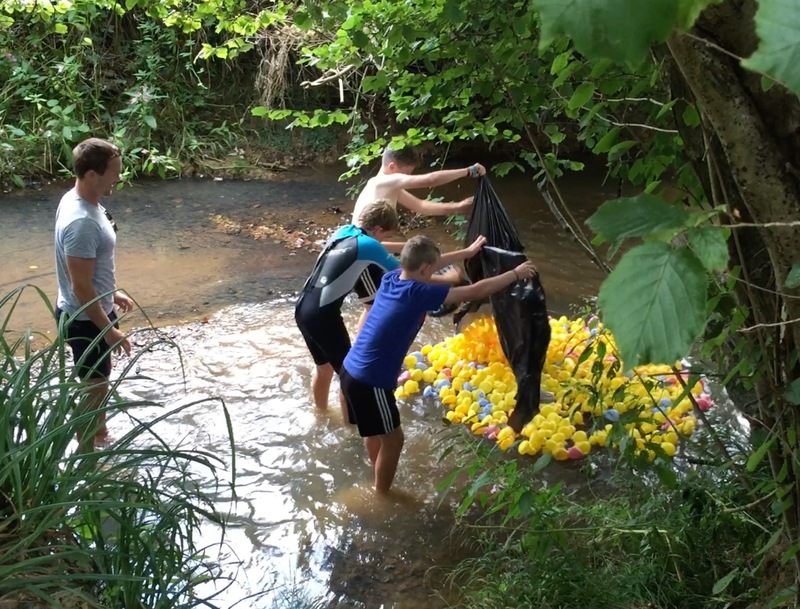 Earlier as the club continued its 50th anniversary celebrations three black sack loads of numbered plastic ducks were released into the River Uck adjacent to the ground for the Duck on the Uck race. 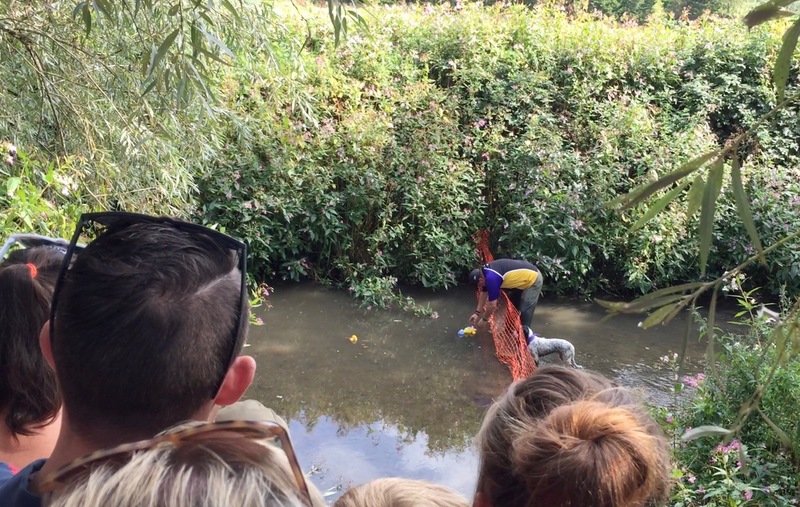 And they’re off … Plastic ducks are released into the River Uck for the Duck on the Uck race. 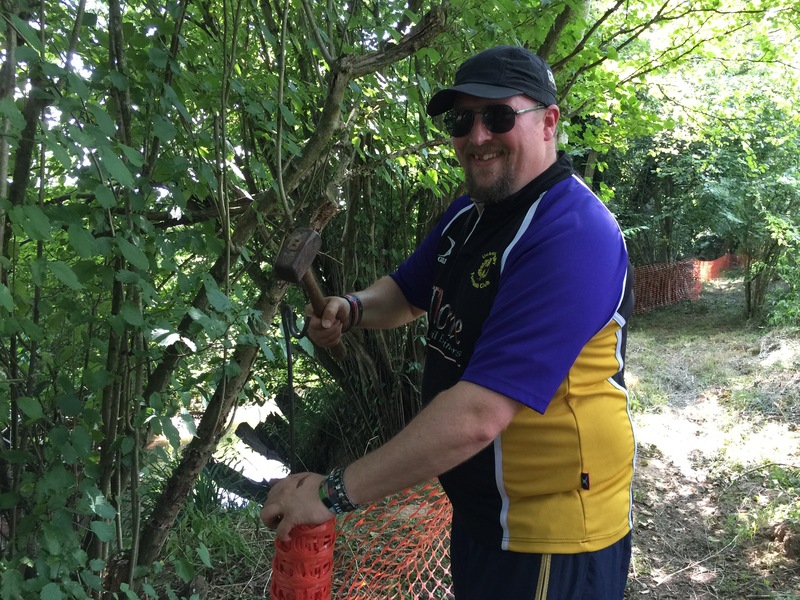 Undergrowth was cut back by club members in the week leading up to the event and on the day itself Steve Swain, the club’s under 12s coach and minis fixtures secretary, put up fencing to stop people getting too close to the water’s edge. Steve Swain puts up fencing before the Duck on the Uck race. He said he has done the same thing for the past five years and it was clear the water was low and a little bit slow this time but while conditions weren’t ideal the route was clear and the ducks could get through. Steve and his dog Lily waited at the finish line to identify the first three ducks. Afterwards they would walk back through the river to pick up any strays. The finish line. Steve Swain and his dog Lily ready to scoop up winners of the Duck on the Uck race. During the evening a live band, Revival, played at the ground. More pictures from Day Two of the Uckfield Rugby Club 50th anniversary extravaganza can be seen below. Pictures from Day One are here. One of the parachutists coming out of the sun to land at Uckfield Rugby Club. Picture by Kylie Rathbone of Robotic Clouds Photography. The first parachutist from The Tigers display team swoops in to land at Uckfield Rugby Club. The second parachutist comes in. Smoke trailing as another parachutist drops in. Another parachutist on the way. All five parachutists together on the Uckfield Rugby Club pitch. President of Uckfield Rugby Club Pete Reeves accepts the match ball from The Tigers Parachute Display Team. 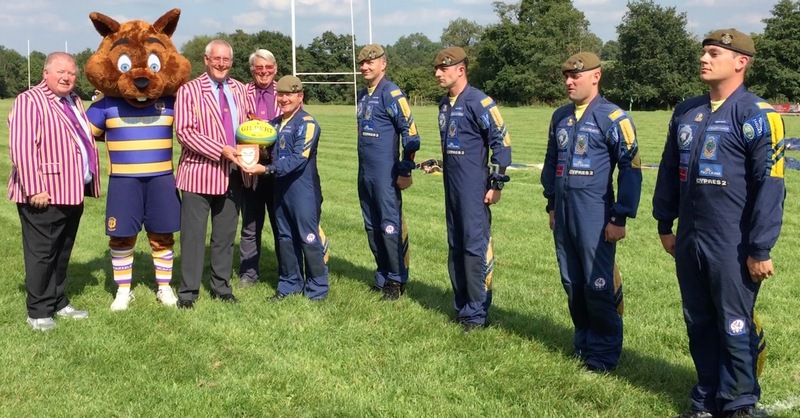 Uckfield Rugby Club match ball delivered by parachutists to club officials.